Note: AFP requires the completion of the following Permission Form by those wishing to reprint or reproduce (in whole or in part) the Code of Ethical Principles and Standards, and/or the Donors Bill of Rights. The form should be faxed or emailed per instruction, and permission will be granted to qualifying requests. Thank you. AFP International - AFP’s Ethics Page will provide you with further information on ethical standards and principles. 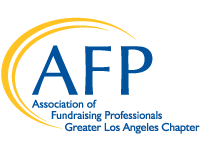 AFP GLAC’s Eye on Ethics program allows members to discuss ethical issues/dilemmas at our Development Seminars/Luncheons in our Table Top sessions. If you have a story to share, please email Melanie Elliott, Ethics Chair (melhelliott@gmail.com) the following: 1) The ethical dilemma or situation; 2) How you solved it; and 3) If you would like us to mention your name/organization or wish to remain anonymous. Your story may be featured and discussed at our Development Seminars/Luncheons. We welcome your ideas and suggestions as to how to further incorporate ethics into our educational programming and chapter. Contact Melanie if you’d like to be more involved.